Gillian Gibbons – the ‘Teddy Teacher’ – has been released and thank God for that. Credit to Sayeeda Warsi for her part in helping to negotiate her release. I only wish that as much attention had been paid to the injustice of Ms Gibbons’ situiation as should be paid to the much greater outrages taking place in Sudan. After Rwanda the world said "never again" but at least 200,000 people – possibly as many as 400,000 – have died in the Darfur region of this country. But the peacekeeping force promised by the world to protect the refugees from the conflict has only reached a quarter to a third of the promised strength. None of the 24 helicopters needed as "force-multipliers" have been provided. Baroness Cox told Radio 4 last week that people are being forced to convert to Islam in return for desperately needed aid. The Khartoum regime – propped up by China – is odious. 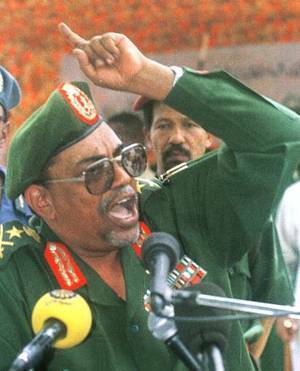 Sudan’s President (pictured) deserves no thanks for his pardon. If you want to make a small contribution to Darfur please visit Aegis’ Fund for Darfur.